Because who else would buy it? You can get trapped in a liquidity event even when you hold something very valuable if you need to sell with urgency and the market for what you hold is thin. What happens when what you hold is worthless and the market for what you hold is nil? 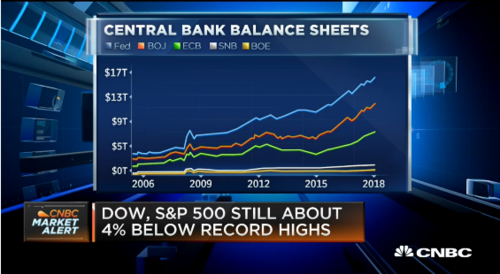 The total assets of all central banks hit $16.4 trillion plus (an all-time high) and these banks now, collectively, own 33 percent of all the world’s sovereign bonds (someone/something had to buy ‘em) up from 14 percent before the ’08 crisis. Surely central bankers aren’t just speculating with funds created from nowhere? However, the once “lenders of last resort” are now engaging in social policies, boosting the collective wealth effect, while keeping the under-capitalized, over-leveraged, and less than competent operators in business.